What Carnival is to Latin America, especially Brazil, Mardi Gras is to the United States. 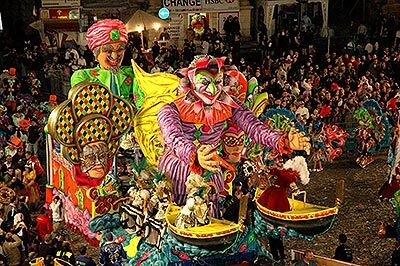 Again if the festive bash is compared, it is New Orleans to Mardi Gras what Rio is to Carnival. These specific comparisons apart, all the southern states of Alabama, Florida and Louisiana celebrate it as a special public holiday though its fame is nation wide. Parades, Pancakes, parties and boisterous fun under the lively carnival colors are the what the galas made of. Mask is also a key ingredient of the celebration. Over the years, with its growth in size, reach and variety, the festival has registered greater national attention. And, from only a limited few, many hosts came in soon to add to its hue and flavor to the parades. Fat Tuesday is always 47 days before Easter Sunday. This can fall anywhere in-between February 3 and March 9, it all depends on the Catholic Church. Though formally it is scheduled to start with the day of Epiphany, the main season of celebration begins about two weeks before Fat Tuesday. On those two weeks, people view the parades and go to the nightly parties. The grand finale of all events takes place on the Shrove Tuesday, the Tuesday before the Ash Wednesday, or, before the period of Lent. Originally the day was meant for pre-Lenten shriving through confession of sins, a Catholic practice. Now pancakes, parades, parties, feasts and dance - all form part of the Mardi Gras galas. Be it the marching of masked revelers, fancy balls or the masked dances, or the theme parties, masks play a prominent role among the traditions of this day. Masks came to be associated with Mardi Gras as a part of the universal tradition for the New Year festivity. According to scholars the masks are used to represent the dead who were wont to return to their homes at this time of changeover. It all began in New Orleans, Louisiana due to its inherent French connection. As is witnessed in many cities and small towns across the United Sates, the masked revelers merely marched through the city of New Orleans on the day of Mardi Gras. In 1857, the first night parade with some grotesque figures made its way to the residence of the city's mayor. It was performed by the Mystick Krewe of Comus. Then in 1872 the Rex Association, with its monarch Rex as the king of the Carnival, came into being with the idea of a spectacular parade show. Floats, bands, colorful marchers, masked knights and monsters came to be associated with the parade. Today there are over 60 organizations who come out with their own parades in New Orleans alone. While the New Orleans tradition is spilled in other parts of the South with parades of masked marchers, floats, and throw ups, many have developed their own style of celebrating the Mardi Gras. For instance, in Pennsylvania, people of German origin, celebrate this day as Fastnacht. So called because they make pancakes of rectangular shaped doughnuts, known as fastnachts. Eating this was believed to bring good luck, while the failure to eat could bring harm through different ways. Also the fat in which the doughnuts were fried was used to grease the wheels of wagons in the belief that it stopped the destruction caused by rats, mice and insects. Fastnacht lard was rubbed on the sore udders of cows. It was virtually applied to any wounds. The Germans also regard it as a no work day and associate some taboos with the day. They believe, if you sew on the day, the chickens would lay no eggs. In rural communities, pupils used to lock the teachers out of their classrooms and allowed them in only when they promised to give the youngsters a holiday. The British traditions associated with Shrove Tuesday are also seen. As in England, pancake suppers are held by many Episcopal churches on the eve of Lent. Originally the practice was a means of using up the milk, eggs, and fat which were not allowed to be eaten during the strict days of Lent. Yet another English tradition came to be introduce in America, though lately. This is the pancake bell run for women. Believed to be originated in Olney around 1445, the legend has it that one woman was making her pancakes when the bell calling the people to confession on Shrove Tuesday, rang. With this the woman ran out grabbing the frying pan and cooking the pancakes as she went. Soon there developed, among the town's women above 18 years, an annual race to the church where women in apron, scarf and hat, keep flipping the griddlecakes all along the course. The race is still held in Olney, from the pump to the market square, a distance of 415 yards. The tradition made its way in America in 1950 when the women of Liberal, Kansas, entered the race in the form of a challenge to the women of Olney. The challenge was to have the race run separately in the respective countries. The racing times were to be compared by transatlantic telephone to determine the winner. The race has been held every year since then and has grown to some proportion. In Liberal there are four days of festivities. While the race is just for fun, prizes, including the traditional 'kiss of peace', a prayer book and a frying pan await the winner. Among other traditions of this day come large community feasts with block parties and gumbo. In some parts of Louisiana, Mardi Gras rides all around the locality collecting ingredients for the community gumbo to be eaten at the large block party. Meanwhile, the wild, boisterous games that spread through city streets came as a remnant of the ancient belief that wars are fought between summer and winter at the onset of spring. Also community dancing as Mardi Gras night ball and dance until dawn in New Orleans form part of the day's revelry.